Those of you tonight in Grand Prarie, TX are hopefully at the Soundgarden/Mastodon show. 2 great bands. And if the merch line isn’t too long you’ll have a chance at Chuck Sperry’s gig poster. Those that couldn’t make it to the show can purchase an Artist Edition from his website soon. 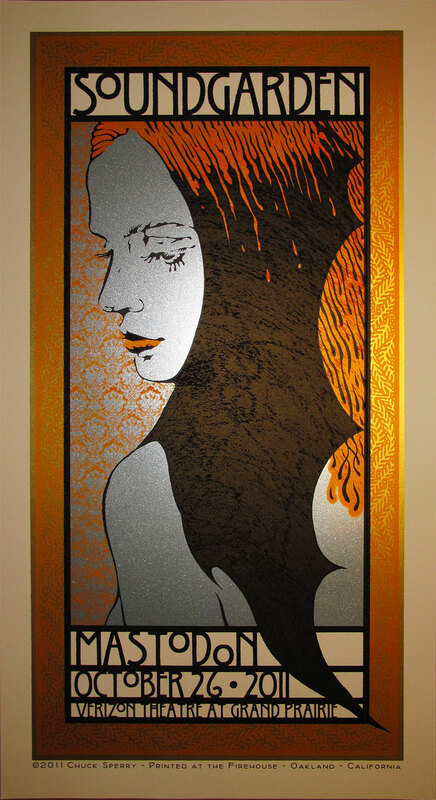 The Artist Edition is an 18″ x 33″ 4-color Screenprint, edition of 100, and is signed/numbered. On sale Wednesday, November 2nd at a random time HERE. "Soundgarden/Mastodon, Grand Prairie TX" by Chuck Sperry. 18" x 33" 4-color Screenprint. Artist Ed of 100 S/N. This entry was posted in Gig Posters and tagged Chuck Sperry, Mastodon, Soundgarden by admin. Bookmark the permalink.